Part of the Orizzonti sidebar at the 72nd Venice Film Festival, actor Brady Corbet’s debut feature The Childhood of a Leader (2015) combines an Ibsen-like austere family drama with a cinematic verve that’s been sadly lacking on the Lido this year. A pounding orchestral overture (courtesy of the legendary Scott Walker) sets the scene as The Great War draws to a bloody, muddy and exhausted conclusion. 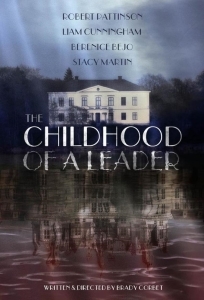 It’s 1919 and as President Wilson convenes European leaders in Paris to draw up a treaty of reparations and carve once more at the map of Europe, in a small house in the French countryside a seven-year-old boy, Prescott (Tom Sweet), collects stones to sling at parishioners leaving a local church. It’s the first of three tantrums which will divide the film into chapters. The child flees into the darkness, hurts himself and is carried back to his mother (Bérénice Bejo). They return to the house where her husband (Game of Thrones star Liam Cunningham), a US diplomat assisting the President, is drinking with Charles (Robert Pattinson), a journalist whose wife has recently died. “All of Europe went into making him,” Joseph Conrad wrote of Kurtz, and the world itself goes into making this household with its Moorish decorations and Euro-American occupants. The American has a wife who speaks several languages fluently and is German-born; there’s an English governess teaching Prescott French and a Belgian housekeeper, Mona (Yolande Moreau), who has a doting affection for her charge. With her husband shuttling between the house and Paris, Prescott’s mother haphazardly disciplines the increasingly unruly boy herself. The child is a slappable nightmare, stalking around with his Goldilocks hair but taking instant umbrage when he’s repeatedly mistaken for a girl. His mother tries to awe him with the priest, shame him by forcing him to apologise and invokes the age-old punishment of getting him to sit at the table until his supper is finished. However, her attempts are all for nought as the boy is “wilful”, as Jack Torrance might say. Nor does it help that she’s undermined by Mona, unsupported by her husband and distracted by ever-growing melancholia. The country house setting and the drawing room conversations could make this a staid piece of prestige drama, but cinematographer Lol Crawley captures every scene with a beautiful eye for detail and just the right framing. At one point the fall of the light shines through Ada’s blouse leaving her vulnerable to Prescott’s precocious attentions yet at another, when she is fired, shines around her as if she is the angel that the mother – for all her religious observance – has missed sitting at her table. The wintry countryside is beautifully captured but there’s no lounging in the sublime here. Once free of the estate and goaded on in the coda by Walker’s rampant score, the camera can also become a wildly frenzied thing. The Childhood of a Leader is a dark, enigmatic piece of work that hovers between visionary greatness and petty domestic triviality. Corbet’s inaugural stint behind the camera marks a stunning debut and the finest film at Venice thus far.